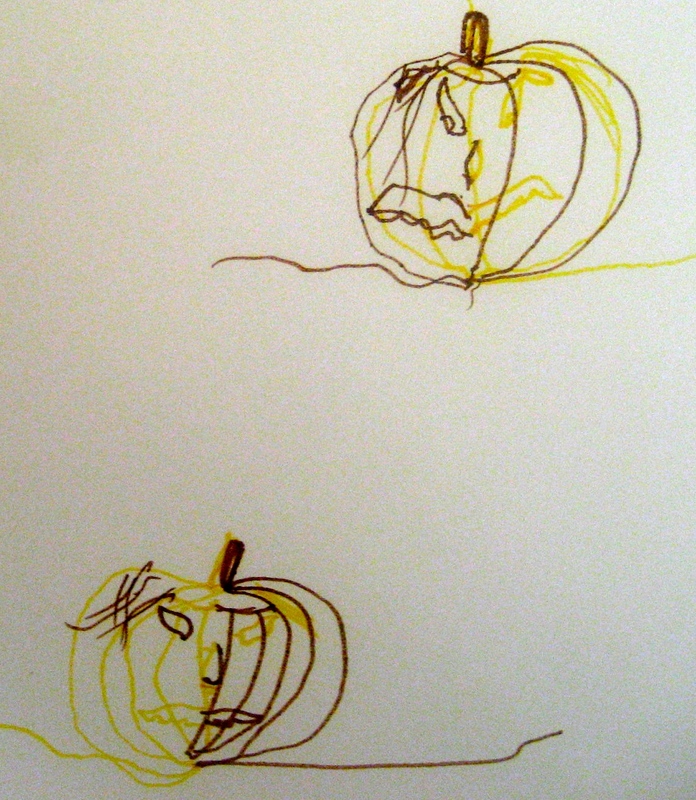 A Halloween Double Doodle (just like any Double Doodle) is drawn using two hands together. 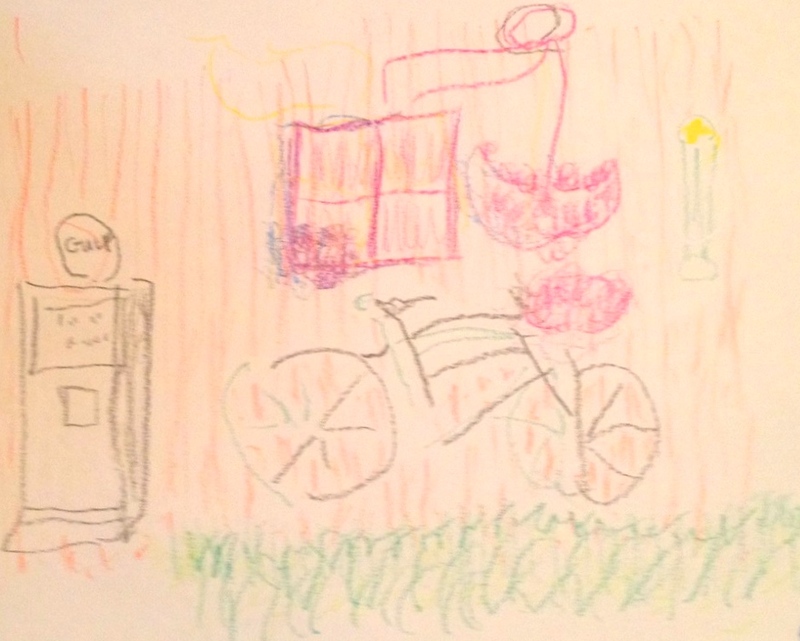 I always find it a delight to share the Double Doodle activity with children. 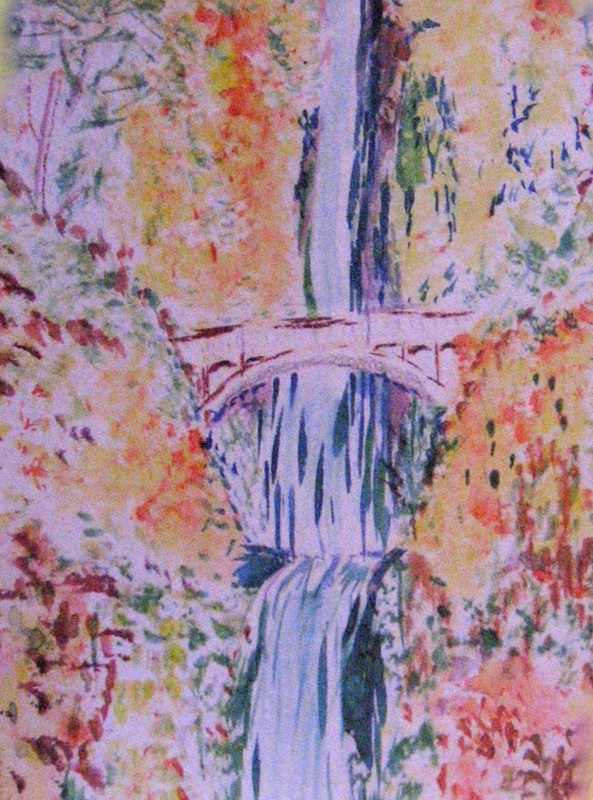 Sometimes youngsters have gotten the idea that they can’t draw, don’t know how to begin, or assume that it’s going to be hard work. When I show them that they have the option to use both hands at the same time, most are initially doubtful. Such was the case when I invited a group of youngsters ages 6 – 10 in an after school program to draw Halloween Double Doodles with me. 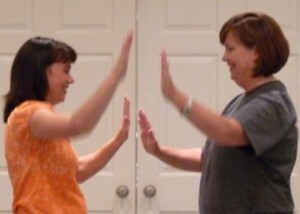 Doing the Double Doodle also helps people shift away from a visually-directed effort toward a proprioceptively-directed one—one where the movement of their hands becomes the focus. Once they experience the pleasure of moving their two hands in sync, their eyes can take a backseat to the experience, and they can even be surprised by what appears! A perfect image clearly isn’t the goal. Yet there’s always something intriguing, playful, interesting, full of character, about the Double Doodles that emerge, as you can see. 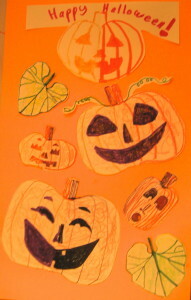 For a tutorial on drawing Double Doodle pumpkin faces and some fun images, click here. To see other Double Halloween Doodles, see Halloween Magic with Two-Handed Play! See Why I Love Teaching Double Doodle Play: A Window to Whole Brain Vision for more about drawing and painting with the Double Doodle. For a beginning tutorial on Double Doodle, click here. 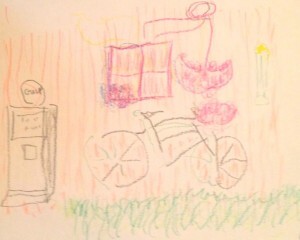 “Bicycle,” by Rhydonia Anderson, captures the whimsy and expressiveness of two-handed doodling. 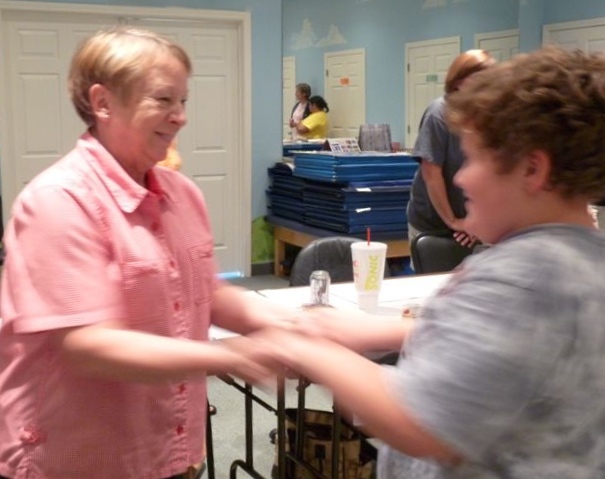 As a Brain Gym® Instructor, I’ve had many remarkable experiences using the 26 Brain Gym activities—first as a therapist at an alternative school, and later as a School Counselor. I was initially drawn to the the Brain Gym concept of basing new learning on learning that is already familiar to the student. I also quickly came to appreciate the educational model of “drawing out” rather than “stamping in”—a playful mindset encouraging growth. Both of these Brain Gym perspectives are consistent with what I later experienced in my studies at graduate school, qualifying as a Marriage and Family Therapist. My husband, Virgil, and I, now “officially” retired, have continued to teach one of our favorite Brain Gym courses, Double Doodle Play: A Window to Whole-Brain Vision* to those who work in schools and developmental therapy centers. 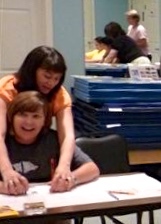 As former teachers, we’re comfortable with these professionals. We don’t want to bore our audiences (like we’ve sometimes been bored in staff development meetings); so it works well that Double Doodle Play is filled with activities that keep everyone moving. In the workshop, participants discover how to draw and paint with both hands (bilateral drawing), as they explore their visual experience of color, shape, texture, depth, movement, and more. Three busy pairs of arms create a Double Doodle group mural. 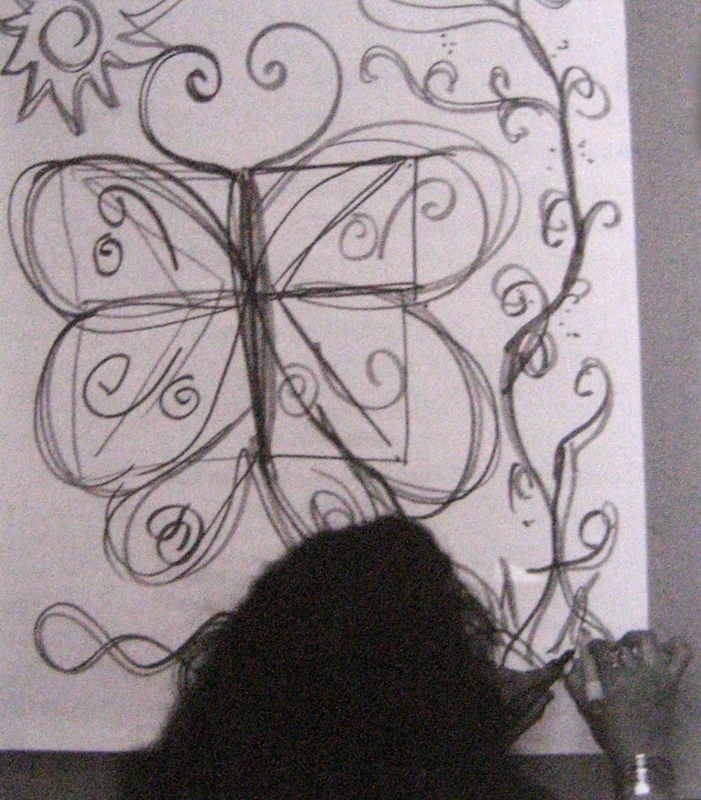 A student completes a Double Doodle butterfly design based on the Nines game. In vision as in artistic composition, the white or empty space that surrounds an object—the background—can become just as important as the object itself—the foreground. Double-doodlers are sometimes surprised at how, without any effort, these shapes of “negative space” naturally emerge in a bilateral drawing to define the boundaries of positive space (the object, or foreground), bringing it into balance. The Double Doodle Play emphasis on process and spaces reminds me of my training in Marriage and Family Therapy, which was also oriented to spaces and to process, more than product. I learned a systems model of relating, which taught me to attend to the space between myself as a therapist and the client, rather than identifying the client as “separate,” and to stay in the process of interacting. 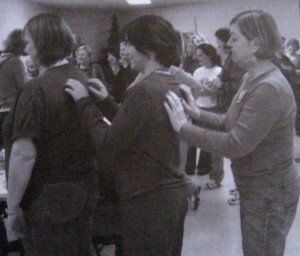 Once, when Virgil and I presented Double Doodle Play at a staff in-service, we were at the school all day, with the teachers, therapists, and aides coming in during their conference periods. A school director later asked me, regarding a couple of the teachers in particular, “What did you do? Those two aren’t usually so settled.” What we’d done that created such a good effect was to guide them through a combination of Hook-ups and the Positive Points, the two Brain Gym activities oriented to self-calming. Partners enjoy Mirror Doodles as they reflect back one another’s movements. 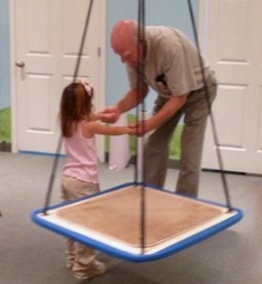 Virgil invites an elementary student to do Iso-Doodles (photo was taken in the therapy room, thus the swing). Two students enjoy the “give ’n’ take” of the Iso-Doodles activity. If we all pull together . . . The success of that in-service led to our largest audience yet—70 parents, staff members, and special ed teachers, all seated at those little elementary cafeteria tables. 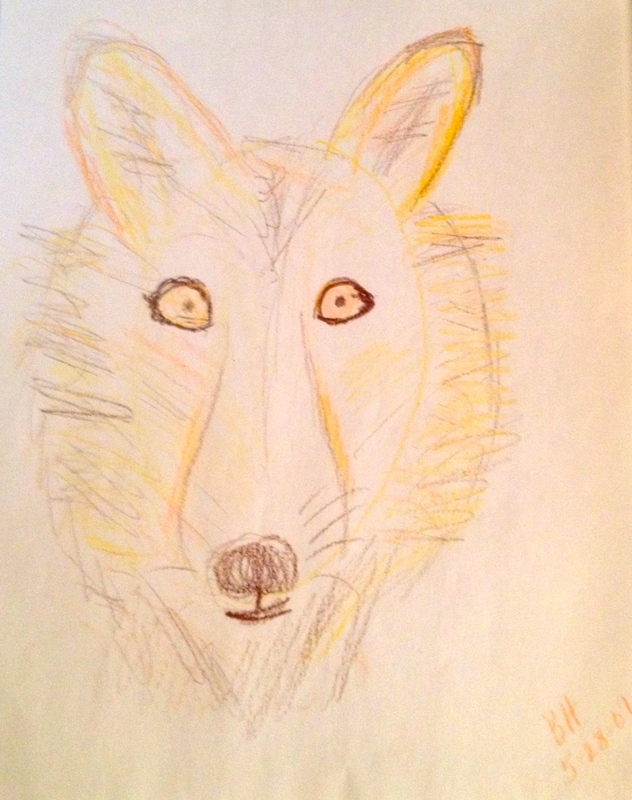 We didn’t keep them sitting long; they were soon standing, moving, playing, and doing bilateral drawing—in the air and on paper. At the end of the workshop, one woman told me that this was the most useful in-service she’d ever attended. Several years ago, when Sylvia Sue Greene, a Faculty Member of the Educational Kinesiology Foundation, first offered the Double Doodle Play workshop, I was interested but doubtful. I emailed her that I couldn’t draw, and Sylvia responded, “You can use both hands, can’t you?” Since I knew her to be recovering from a stroke and still teaching, I felt humbled by her question and chose to take the workshop. Virgil had taken one Brain Gym 101 workshop; he’d driven me to a class I co-taught, and simply took the class since he was already there. His goal, he said, was to get a deer; he considered this “a joke,” since he didn’t put much stock in it—until he got a deer the next time he went hunting! With some encouragement, he then agreed to attend a basic day-long Double Doodle Play workshop. The teacher, Gail Dennison, was impressed by Virgil’s creativity and mentoring spirit as an educator, and invited him to accompany me in attending—the following day—the Teacher Practicum for Double Doodle Play. He’d be qualified to teach the Double Doodle Play workshop once he completed the prerequisites, which he did! The one-day Double Doodle Play includes movement, drawing, and painting activities, done solo, with a partner, and as a group. It serves as a fun introduction to Brain Gym—with tools for maintaining and improving everyday visual and movement skills. People often make gains in their visual responsiveness as they play together in ways that engage seeing, tactility, or tool-holding abilities, while learning to notice both one-sided and whole-body habits of moving. Wind and Water, a partner Doodle game, delights players as they discover a relaxed use of the hands for mark-making. There’s much laughter as students draw with eyes closed, in the Wind and Water game. We also enjoy the cooperative games, which quickly build a sense of community. For example, in one class, we had teachers sit four to a table, with two crayons for each person. We gave one person a sheet of paper, and when I said “Start!” that person began drawing a Double Doodle (I had Virgil’s help in monitoring the groups, in case anyone needed materials). After a few seconds, I called “switch!” and the drawing would be passed to the next person to be continued— a process that always generates a lot of laughter. After all four people had each had three or so turns, I called “Stop.” We have sometimes done this Cooperative Drawing game to music—each person drawing a shape to represent the music. At yet another school, when we stopped, we had each table’s group make up a story for their picture. The day ended with each group sharing their story while displaying their picture. 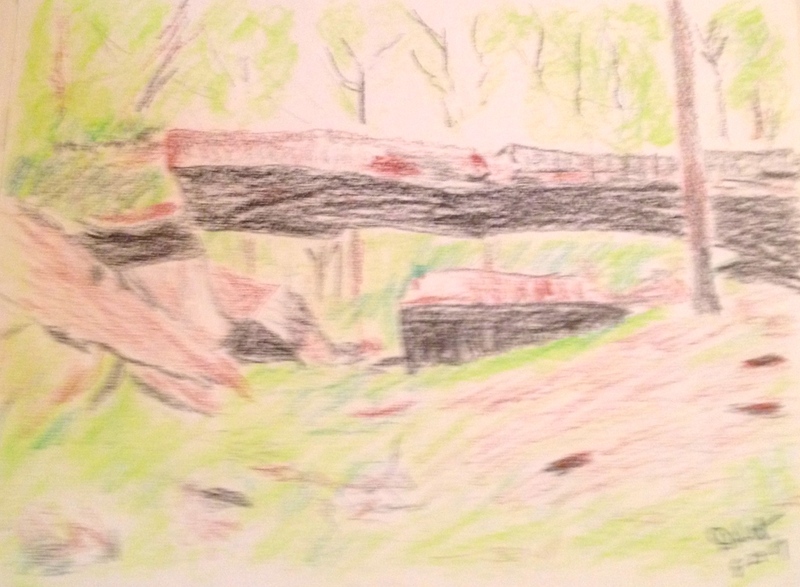 Daniel’s Natural Bridge, drawn after visiting the bridge, in Clinton, AK. 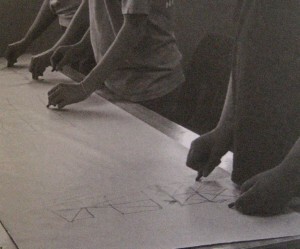 Students form a Double Doodle Train, simultaneously exploring shape-making while enjoying tactility. For our internship, Virgil and I spent a day teaching Double Doodle Play at the school where I’d been a counselor the previous year. The art teacher commented about a boy in junior high who’d done Mirror Doodles with Virgil, saying that he didn’t ordinarily mix much with classmates but had really participated on this day. When I spoke with that teacher the following year, she reported that, due to scheduling difficulties, she now had 8th graders and seniors together in one class, and that the 8th graders—who had experienced Double Doodle Play for just one class period the previous year—were actually more creative than the seniors! *The Double Doodle activity expands on the bilateral drawing work of G. N. Getman, O.D., from his book How to Develop Your Child’s Intelligence, ©1962; 1992. The Double Doodle was first included in Brain Gym®: Simple Activities for Whole-Brain Learning, by Paul and Gail Dennison, ©1986, Edu-Kinesthetics, Inc., Ventura, CA. The games and activities described here are from the course manual Double Doodle Play: A Window to Whole-Brain Vision, by Gail E. Dennison, © 2006; 2007; translated into nine languages. Rhydonia Anderson, Ed. 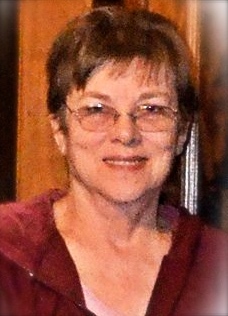 S., of Arkansas, a licensed professional counselor and Marriage and Family Therapist, is a former specialist in school counseling, now enjoying retirement. Rhydonia’s career experiences include serving as a home economics teacher, an outreach therapist for a mental health clinic, and a counselor in an alternative learning environment for students who had difficulty in regular school. She identifies herself as a lifelong learner. Rhydonia’s husband Virgil Anderson, M.S. Ed., taught life sciences in junior and senior high school and is also now, along with Rhydonia, experiencing the “freedom of retirement and housebuilding.” He loves to hunt, fish, and do woodwork, including timber frame. Rhydonia welcomes your comments, questions, and feedback, and can be contacted at rhydonia@aristotle.net. © 2015 by Rhydonia Anderson. All Rights Reserved. It’s suddenly fall again. There’s a change in the air . . . a new tension and resolve. The blues and greens of summer are turning orange and brown. I’m hearing questions from children that they often ask at this time: Can we make decorations? Can I have a different costume? What can I be for Halloween? I know many youngsters (and grown-ups, too!) who anticipate Halloween with great pleasure, yet I also know some who don’t seem to be quite ready for all the excitement. So here are some playful Halloween images that call on the typical colors and themes of Halloween yet are a little brighter and perhaps more humorous in tone, giving the child within us some choices regarding the more “scary” elements. 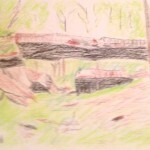 I created these three projects using the Double Doodle process (if you don’t know how, click here for a way to begin). 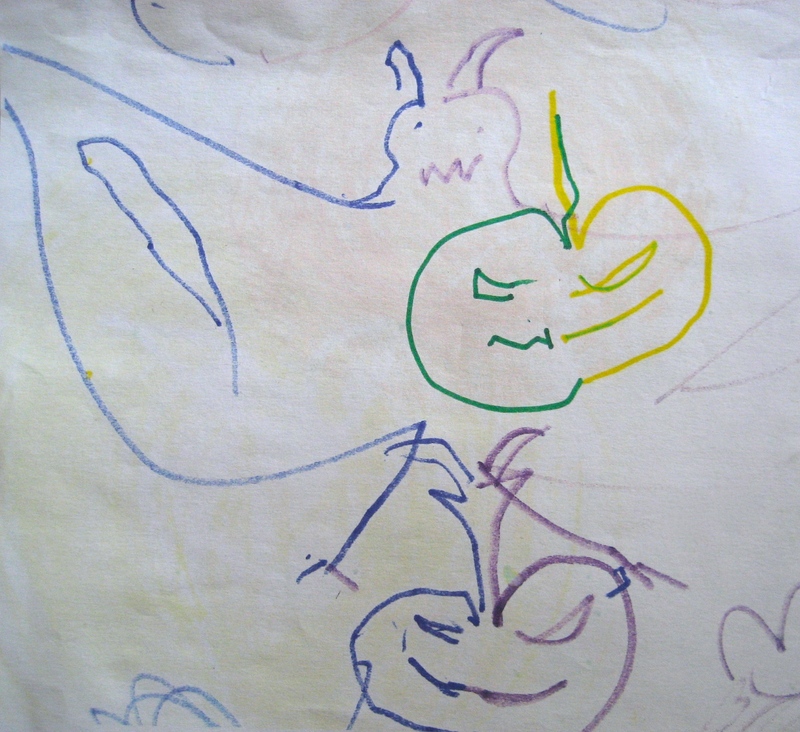 Most children by age 9 and older can easily draw Double Doodle ghosts (as in picture two; newbies may initially want to draw these right around a midline fold). 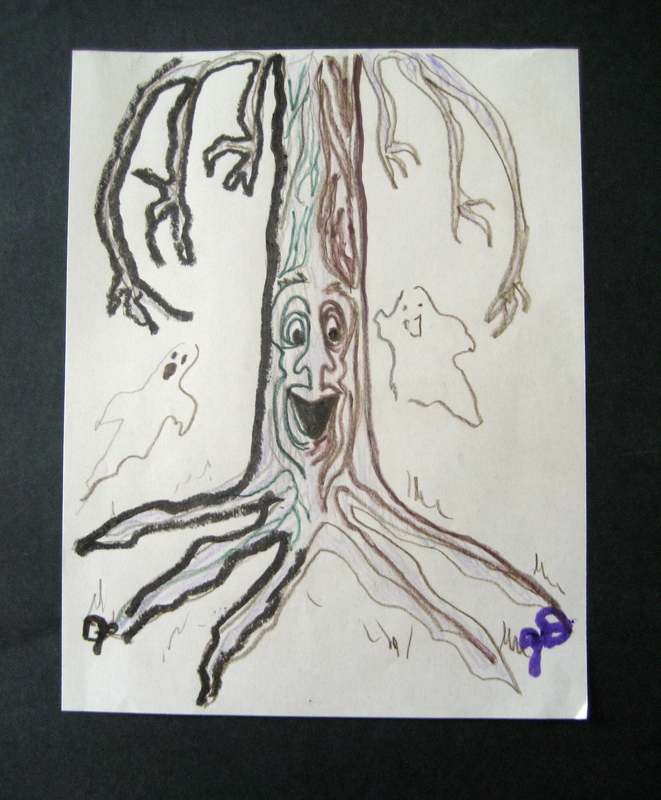 They’ll also have fun with the slightly more difficult Double Doodle-style tree (like this one with a face), made by letting the hands move fluidly up and down to the right and left of the midline of the page. These don’t have to be precise mirror-image shapes; enjoy experimenting with asymmetries within a symmetrical context, as seen here. And feel free to fine-tune your image using your dominant hand. After all, this is your design. A whimsical scarecrow is a bit more challenging. I explain to youngsters that the scarecrow, usually in the shape of a human and dressed in old clothes, has been important to farmers around the world. It’s often homemade—a decoy used to keep crows and other birds from eating seed or ripening crops, thus it’s name. 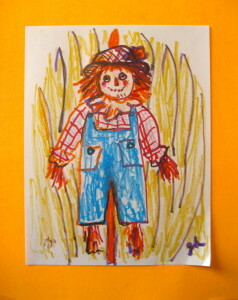 The scarecrow is placed in an open field, like the cornfield suggested here. Your Double Doodle can be as simple or elaborate as you like. 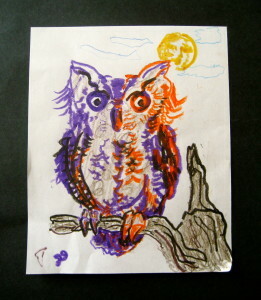 The owl, as I’ve drawn it here, still rests on the midline yet leaves room for asymmetry. I’ve added a gnarled branch on which he sits, and a full moon to reflect on. 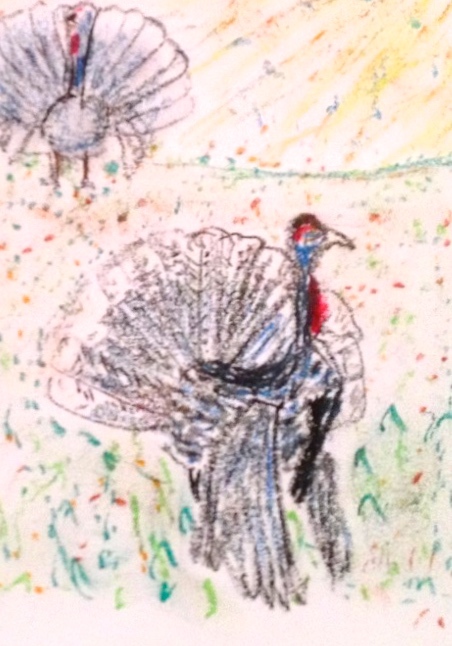 As you Double Doodle, notice how relaxed your eyes, hands, and mind become. Notice, too, the pleasure of choosing your own colors and shapes, and of letting your unique versions emerge. 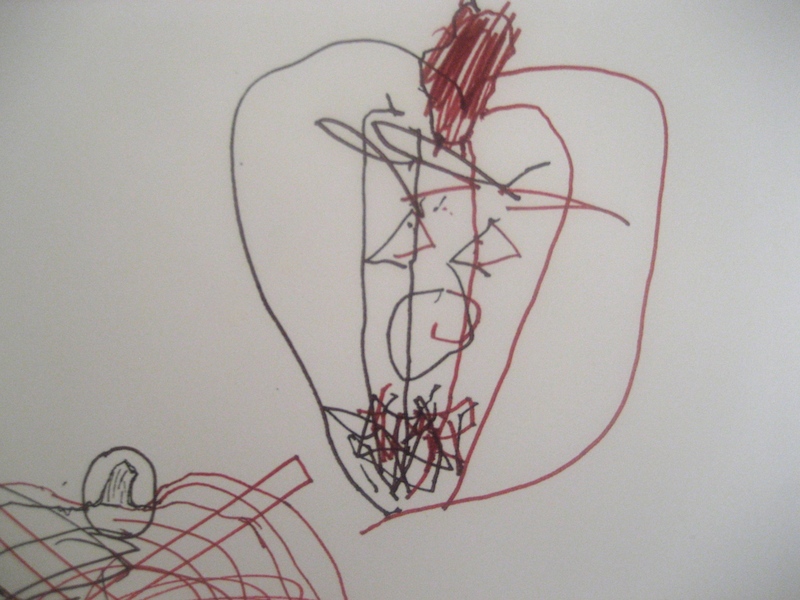 I see that, for children, any “scariness” is diminished by the power of their own personalized doodles. Perhaps this is part of the power of symbol itself—from image to alphabet to word. Beginning with a child’s first scribbles (“Look Mommy, it’s a kitty!”) to more structured mark-making, the excitement we feel as we construct a visual mark to represent some element of our world can rarely be matched by a pre-made art project or computer graphic that merely duplicates someone else’s ideas. This excitement is the very essence of what nurtures a love of symbols and literacy—and ultimately, of reading. To see a 1 min. vimeo of children’s Double Halloween Doodles, click here. For a tutorial on Double Doodle Halloween pumpkins, click here. To see how the Double Doodle can be used for drawing and painting, see Why I Love Teaching Double Doodle Play: A Window to Whole Brain Vision. For Christmas Double Doodle images, Double Doodle Holiday Play. Happy Halloween! May you enjoy the parade of trick-or-treaters that come to your door. It’s fun to talk with youngsters, hear what they have to say about their costumes, and to take a moment to admire these (and as mentioned, you might be helping to instill a love of artful creating plus the language to go with—the heart of loving to read and write). At our house, we give out small trinkets—rings, games, colored pencils and such, and enjoy the inevitable surprised delight that children express when they realize they’re getting something besides candy. *The Double Doodle is one of 26 Brain Gym® activities from Brain Gym®: Teacher’s Edition by Dennison and Dennison, ©2010. 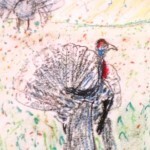 The introductory course Double Doodle Play: A Window to Whole-Brain Vision offers a full day of exploration built on mirror-image mark-making and painting. For the name of a Brain Gym instructor, see the Foundation website, below. 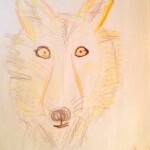 For a Double Doodle Play instructor, click on the link and look up 105DD under courses. For a translation of this article into Spanish, click here: Magia de Halloween con el Doble Garabato! 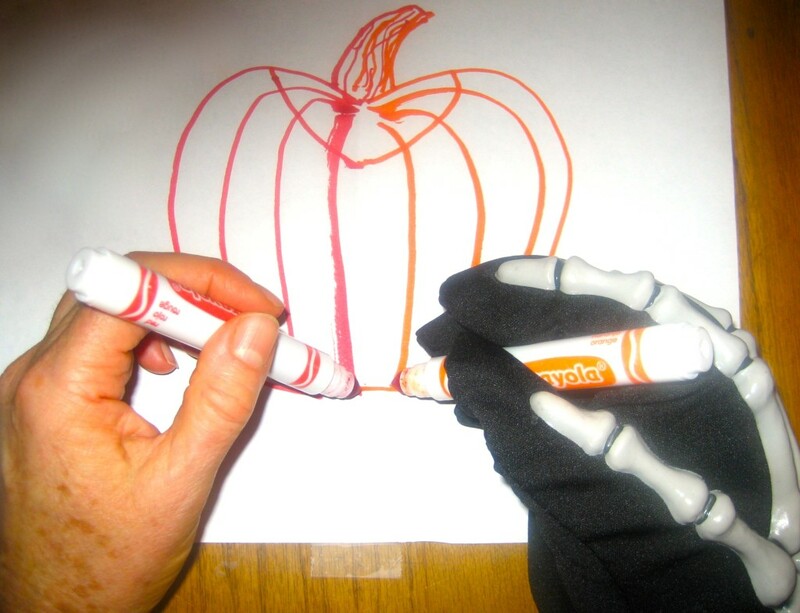 Use two hands at the same time to draw a Halloween pumpkin! Two hands, two markers . 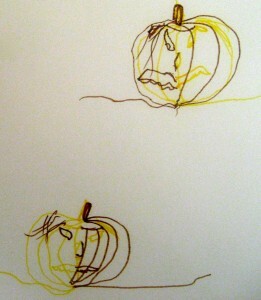 . . let’s draw Double Doodle pumpkins! Part of the fun is being surprised by the kind of face you create on your jack-o’-lantern. Will it be funny, sad, mad, or scary? 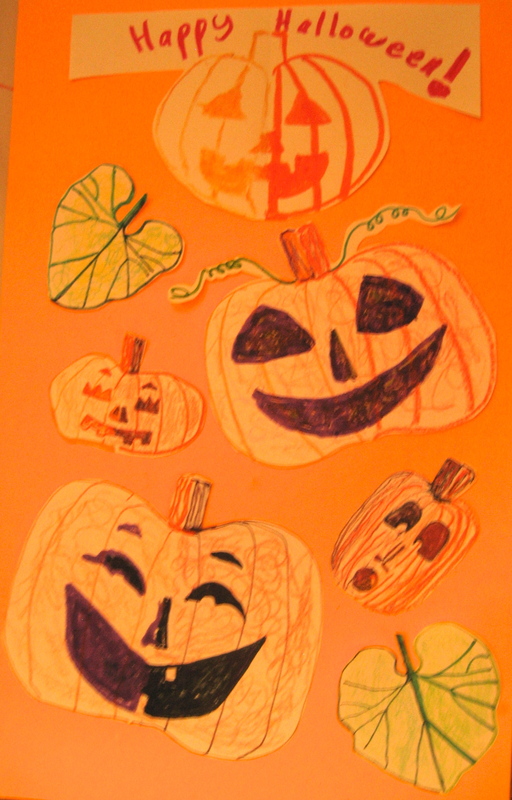 Will you give your pumpkin face some teeth, eyebrows, a stem hat, a downward mouth, or a ghoulish grin? Well, get your giggle on . . . bring a pout or your biggest growl and get ready to be amazed! 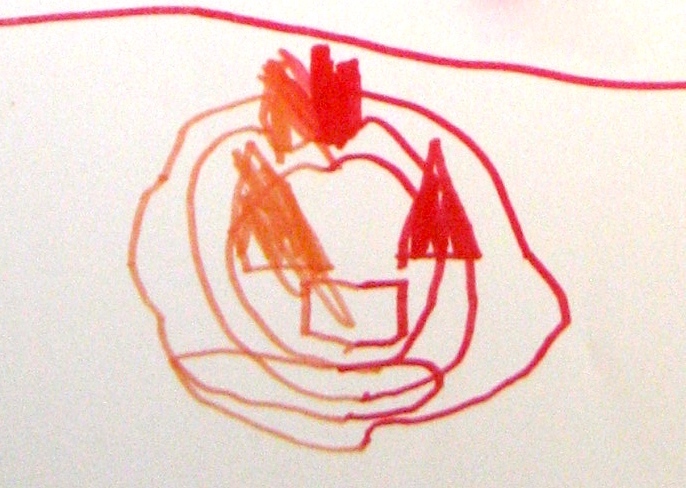 Here are two Halloween Pumpkin faces, drawn by a 6-year old within minutes of one another. You can see the fine-motor skill he’s developing as he experiments. 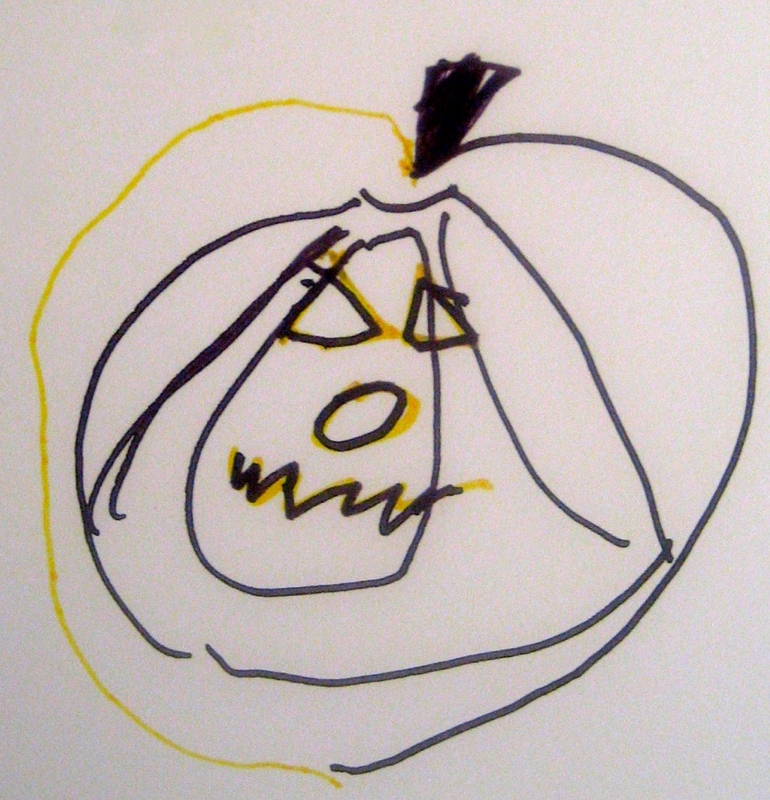 Another pumpkin from an 8-year old just getting in the groove. To begin, fold your paper vertically, as you see in the opening photo. Choose your colors, and then let your hands start flowing smoothly from the top of the pumpkin’s stem (just on the fold mark), down and up a few times slightly to the right and left to widen the stem. 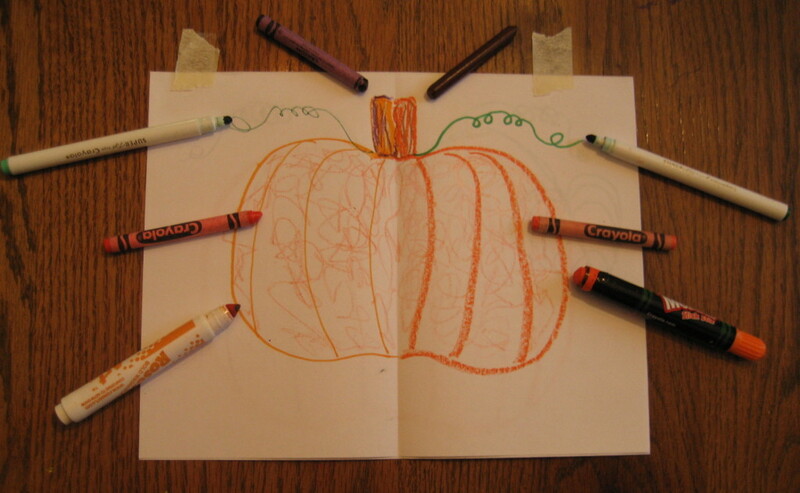 Next, make the curve across the top of the pumpkin, down the sides, and bring your hands together at the bottom. A brown and yellow Double Doodle pumpkin and his pumpkin head friend (drawn by an 8-year old). Ooh . . . which face is the scariest? Now that you have your symmetrical contour, place your markers where you want the eyes and draw mirror-image shapes (see samples, below, some of which we cut out and pasted asymmetrically on orange poster board). Follow with the nose and mouth. Add lines and other features as you wish. 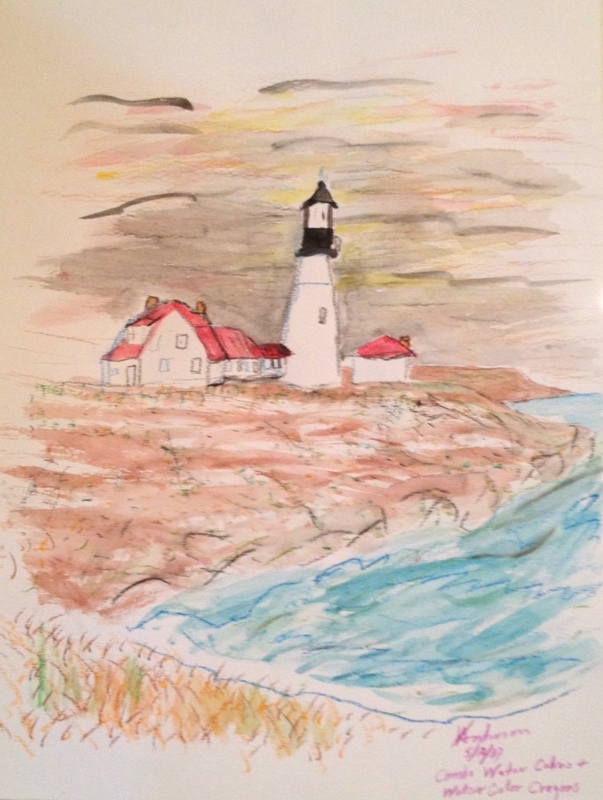 You might enjoy tracing over your lines with different markers to layer additional colors, or scribble in with crayons, finger-paint style, as we did here. Decorate as you like. Notice how your hands enjoy moving effortlessly together like this—a kind of movement quite different from doing a one-handed drawing. A youngster focuses on the pumpkin’s indented ribs, running from its stem at the top to a single point at the bottom. 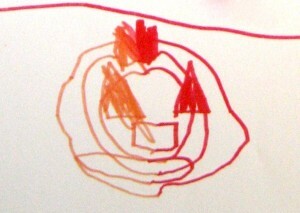 A 6-year old finds a more simple way to suggest the pumpkin’s ribs. And there’s no need to think of this by the rules of ordinary drawing; the Double Doodle doesn’t fit the same criteria. This is more about the fun, zest, color, and surprise of the shapes, and how each can be uniquely your own, than about it looking like someone else’s picture. So enjoy any quirks or unexpected squiggles that you make. 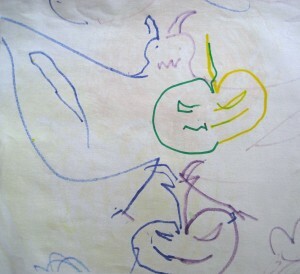 This free-flowing design of bat with pumpkins was drawn by a 10-year old. Once you’ve completed your pumpkin face, you might want to add a leaf or two. Many types of pumpkins have heart-shaped (cordiform) leaves. For autumn, add some yellow, green, brown, or maroon colors, and maybe a serrated edge and some prominent veining (as in the leaves on the banner at left) to make the image more leaf-like. For design fun: Double Doodle some heart-shaped leaves and tear-drop-shaped seeds, like the pumpkin seed, as a design around the outside. 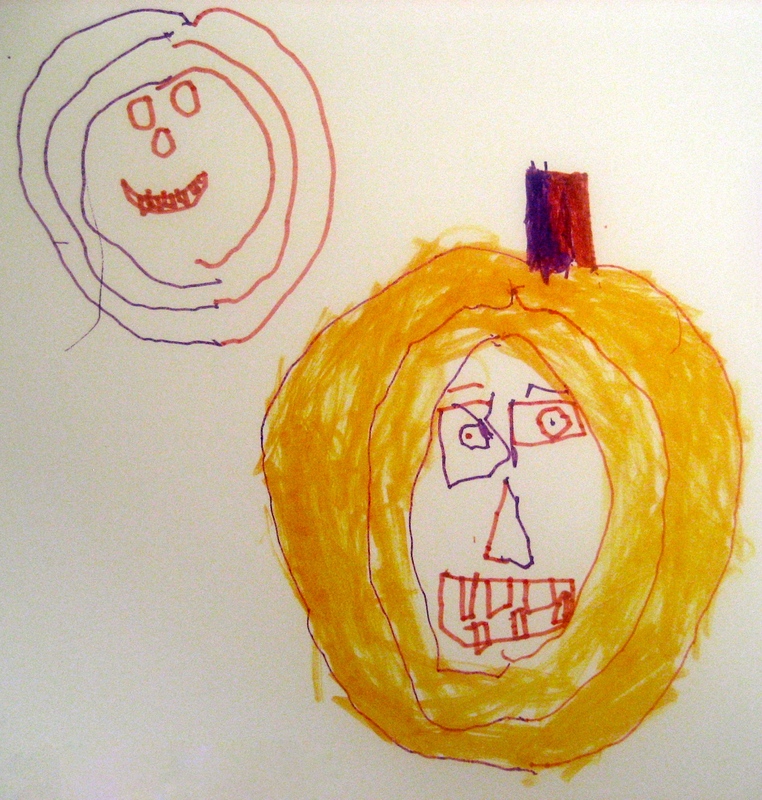 Color in the face shapes on your pumpkin in finger-paint style. Delicious to know: Chewy pumpkin seeds are nutritional powerhouses (abundant in minerals from magnesium and manganese to copper, protein, and zinc) high in fiber, protein, and antioxidants. They make a great snack! When you carve a pumpkin, simply wash and drain the seeds, and dry them for about 30 minutes. Then mix in a tablespoon of oil for each cup of seeds and roast them on a cookie sheet in a 250° oven for 10 to 20 minutes (stirring every five minutes or so) until they’re golden brown. Sprinkle them with salt, or with cinnamon and a little ginger and allspice. 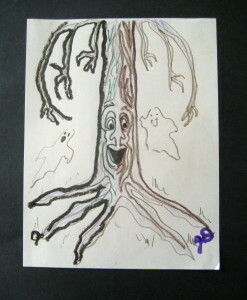 For more complex Double Doodle Halloween images, click here. To see other examples of how Double Doodle Play can be used for drawing and painting, click here. Parents and educators: Scientists continue to study the puzzling genetic and environmental factors that determine handedness. 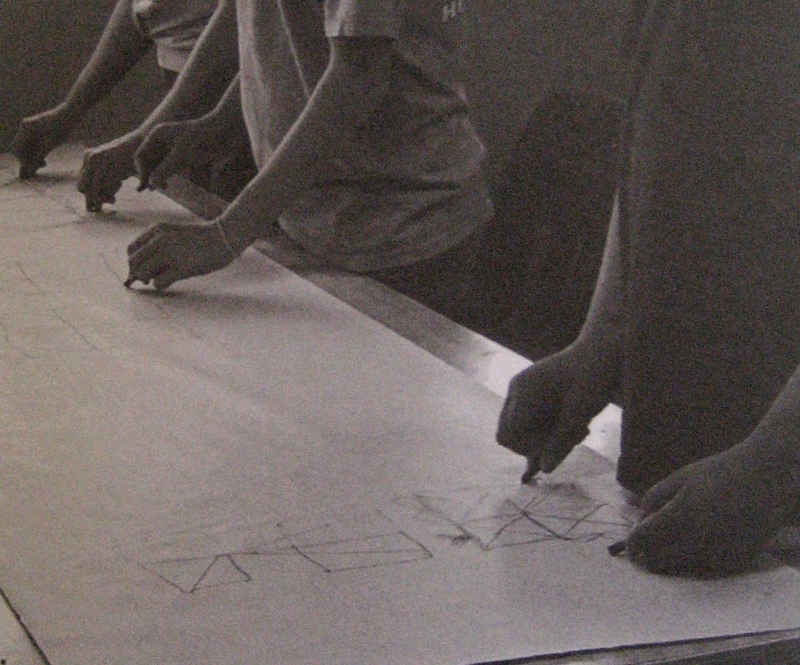 In the Edu-K work, we’ve been finding for more than 40 years that using two hands together like this helps people learn to do more fluid mark-making, regardless of whether they’re right- or left-hand-dominant. See if handwriting is easier for you after doing a few minutes of the Double Doodle. In a Psychology Today blog, coach, author, and world-class endurance athlete Christopher Bergland reminds us that “Researchers remain perplexed as to why the human brain seems to be more asymmetric than the primate brain and why the ratio of right- to left-handedness in humans is 9 to 1. Primates are evenly split 50-50 between left- and right-handedness. The Double Doodle and other Brain Gym® activities that support sensorimotor skills are described in detail in Brain Gym®: Teacher’s Edition, 2010, by Paul E. Dennison and Gail E. Dennison. Many sensorimotor skills are taught experientially, through movement and play, in the courses Brain Gym® 101: Balancing for Daily Life, Double Doodle Play: A Window to Whole-Brain Vision, and Visioncircles: 8 Spheres of Perceptual Development. Click here for the name of a Brain Gym® Instructor in you area. 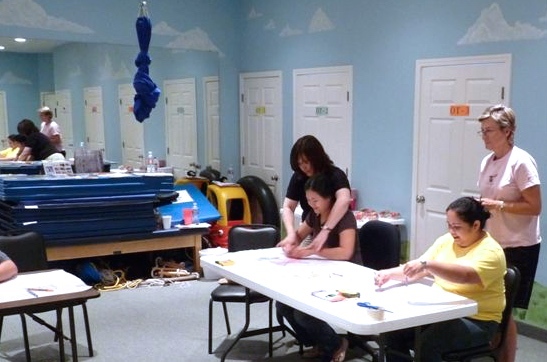 Brain Gym® is a trademark of Educational Kinesiology Foundation/Brain Gym® International. © 2013, 2017 by Gail Dennison. All rights reserved.